Workman Publishing Company, 9781523504763, 408pp. “Truth—or dare?” Those three little words have inspired raucous giggling in generations of kids. Capturing all of the ridiculous, interactive fun of the classic sleepover game, Dare Ya! 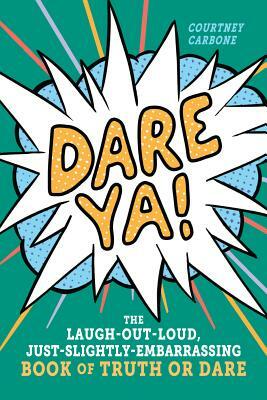 challenges readers with 200 truths and 200 dares, in the same delightfully chunky fun-and-games format as Workman’s You Gotta Be Kidding (which has a whopping 399,000 copies in print). A fun way to engage with friends—and even get to know them better—Dare Ya! promises lots of laughter, and a little bit of blushing, to keep kids playing again and again. There are zany dares, perfect for cracking everyone up: Do a funky dance for 30 seconds! Truth questions that are bound to prompt a funny story: Have you ever eaten so much candy that you got a stomachache? And others that are only slightly embarassing: Write a song about your crush. Bonus points if you sing it out loud to a friend! Each challenge also features related, silly jokes and offbeat trivia in the sidebars (Did you know that not all birthmarks show up at birth?). At an impulse price point, it’s perfect as a stocking stuffer, or to tote to a birthday party or tuck into a camp care package. Courtney Carbone studied English and creative writing in the United States and Australia before becoming a children’s book writer and editor in New York City.